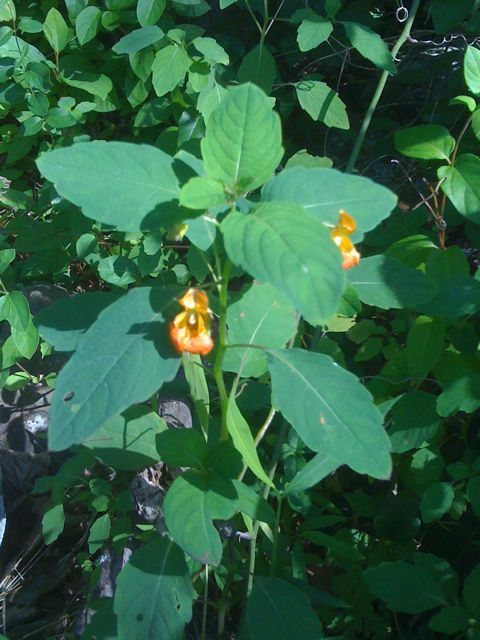 While hiking in the mountains recently, I came across several patches of Jewelweed (Impatiens capensis). The plants were lush, and several were about 4 feet high. I carefully picked off about two cups of leaves, stems and flowers, with the idea that I would create an infusion from them. The plant gets its name from its leaves’ strange characteristic of resisting water — if you pour it on the leaves, the water simply beads up in balls that look like little crystal gems. One of the medical constituents of jewel weed is Lawsone, which has antihistamine and anti-inflammatory activity. 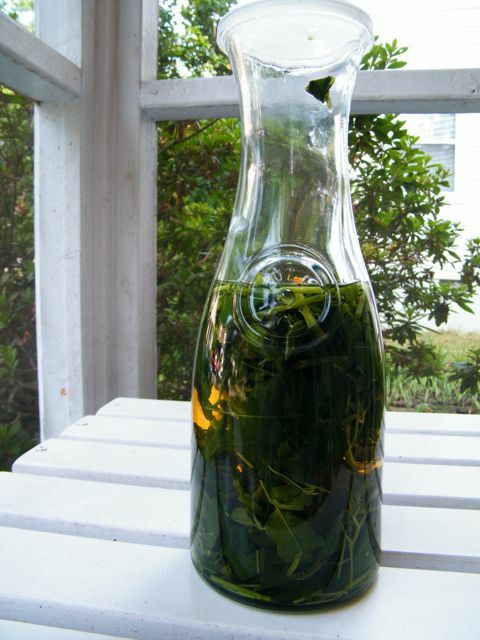 I experienced the medicinal power of jewelweed several years ago while on a guided nature walk. I accidentally brushed against stinging nettle with my bare calf, which instantly resulted in extreme stinging pain and a raised, burning rash. The woman guiding us pointed out some jewel weed growing next to the nettle and instructed me to grab a bunch, smash it into a ball and rub it against the inflammation. It was miraculous how quickly it alleviated the pain. And the swelling went away just as quickly. I have since read that it works equally well for insect stings and poison ivy. It also is effective in preventing poison ivy rash if rubbed on immediately after exposure to the poison ivy. For an instant cure, you can just crush up a bunch of leaves, stems and flowers until they become juicy, then apply the poultice to the affected area. Or you can make an herbal infusion. 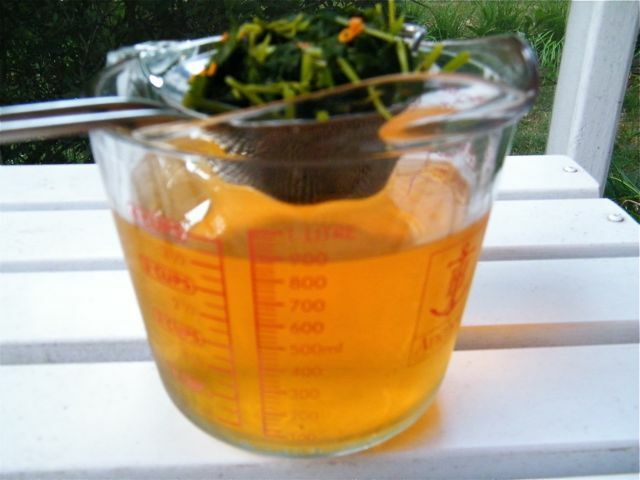 I made an infusion of the leaves, stems and flowers and used it to make jewel weed and calendula soap. It will be fully cured and ready for sale by the next Ballston Arts & Crafts Market, scheduled for August 14! 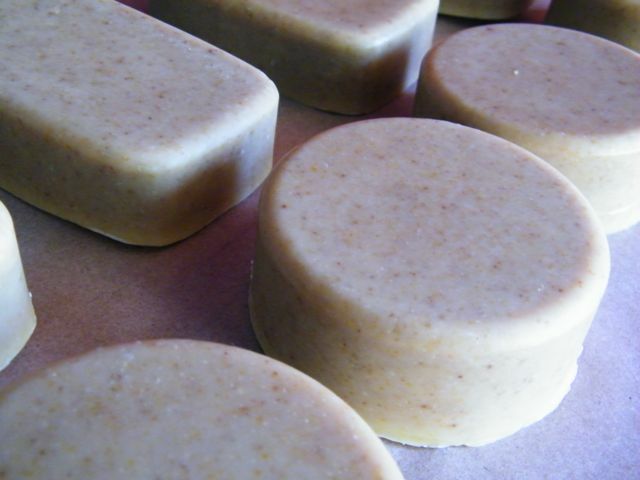 This entry was posted in herbal, herbalism and tagged Ballston Arts and Crafts Market, herbal, hiking, Impatiens capensis, infusion, jewel weed, jewel weed soap, medicinal, poison ivy, soap, wild harvesting, wildcrafting by YourStellarSelf. Bookmark the permalink. Wow, this is so cool. Love the healing potential of plants. The name jewel weed makes me laugh. (Yes, I know, easily amused over here!) I’d love to be able to buy some jewel weed soap. Thanks! I kept hearing a Jewel song in my head as I was writing it, particularly since I had just seen her Funny or Die Karaoke video yesterday! One of the most fascinating series of books I’ve ever read was written by Jean M. Auel, and began with “Clan of the Cave Bear”. The second book, especially, “Valley of Horses”, had more lore and information on the medicinal values of plants than I’ve ever seen in one place. Marvelous reading. This is just fantastic. Kudos! Thank you, Cindy. I hope you find it useful! This is neat! When I grew up we always had to watch for poison ivy when we walked in wooded areas. Thanks for sharing this insight.